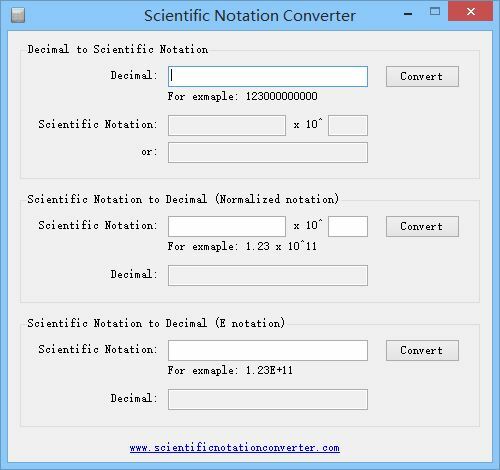 Scientific Notation Converter is a free math software to convert numeric value between scientific notation and normal decimal notation, with a friendly interface, it is very easy to use. 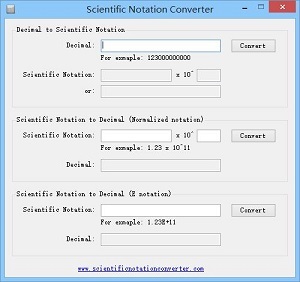 If you frequently use scientific notation in your life or work, this software will be an effective tool on your computer desktop. Scientific Notation, it also called as "Standard Form" or "Exponential Form", in this notation, a numeric value is written in the form of a * 10 ^ n (1 <= a < 10), it can easily represent very big or very small number, accuracy is more clear. This numeric form brings great convenience for mathematics, engineering, computing and more. In a computer or calculator use E or e (Exponential) to represent the power of 10. Please note, currently, the program approximate range is ±5.0 × 10 ^ −324 to ±1.7 × 10 ^ 308, the precision is 15-16 digits. Copyright ScientificNotationConverter.com, All Rights Reserved.